I cherish the childhood memories I have of picking flowers directly from the garden and rushing in to surprise my mother on Mother’s Day. There is nothing more beautiful nor more perfect than sending mom a hand crafted wreath for the home or a live flowering plant for the garden. A living plant is a wonderful way to honor your mom for years to come. Typically, we think of shades of pink and purple which are ever so popular for this holiday. 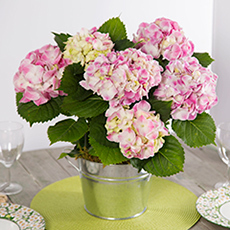 You can’t go wrong with our Mother’s Day Pinking of You Hydrangea Plant. This flowering masterpiece will bloom in the garden year after year. 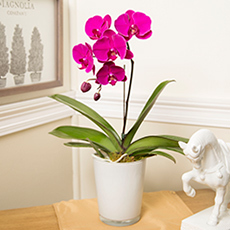 For something a bit more exotic check out our Mother’s Day Color Rush Orchid Plant in brilliant fuchsia colors. Another great gift this Mother’s Day is our exclusive Mother’s Day Purple Passion Wreath! 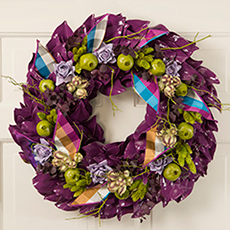 If her favorite color is purple, then this wreath is perfect and will adorn her home for many years. These are just a few ways to thank mom (or another important woman in your life) for all she does throughout the year. Many of us celebrate Mother’s Day, but not many of us have all of the facts or know the history behind this holiday, so I thought it would be fun to take a closer look as we approach May 14th. In 1872, Julia Ward Howe, who was a pacifist, suffragette, and also the writer of the “Battle Hymn of the Republic,” was the first to ask for an official Mother’s Day in the United States. She suggested the day would be one in which mothers could rally for peace. For several years, she held an annual Mother’s Day meeting in Boston. In 1908, Anna Jarvis began a campaign for a nationwide observance of Mother’s Day. Anna never had any children of her own but wanted to carry out her mother’s wishes of having a day just for moms. On May 9, 1914, President Woodrow Wilson signed a bill recognizing Mother’s Day as a national holiday. In its beginnings, people observed Mother’s Day by going to church and writing letters to their mothers. Eventually, sending cards, giving gifts, and sending flowers were added to the tradition.